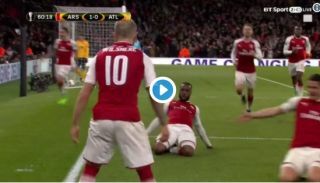 Arsenal striker Alexandre Lacazette opened the scoring with a fine header to make put his club 1-0 up against Atletico Madrid in the Europa League semi-final. The France international is really coming into form at the right time for Arsenal, scoring seven goals in his last seven games for the Gunners now. The resistance has been broken! Arsene Wenger would dearly love a victory tonight as he leads Arsenal out in a European match at home for the last time in his 22 years in charge of the north Londoners. The French tactician recently announced he’d be stepping down at the end of this season and the Europa League is now his last chance at a trophy for the club. If Arsenal were to win the Europa League it would also qualify them for the Champions League again for next season, which would be a big boost for whoever replaces him as manager. For now, Lacazette’s goal is the difference in what has been an intriguing tactical battle at the Emirates tonight.